Register Log In Britbike forum Forums Bsa gold star forum Correct needle for 1000-series Concentrics? Thanks for pointing out that possibility but, of course, I hope your're wrong and GreggK is right. If I do end up having to take the engine completely apart I'll be changing the 10:1 piston for something more suited to today's fuels. Conveniently, I have a Pearson crank assembly sitting on the shelf that I bought when the pound sank after the Brexit vote. I thought I was clever buying it then but little did I know the Brits were determined to do everything in their power to make the exchange rate even better. ..every big-end seizure cloned has a silver-plated cage lining! Kerry has a good point: I recall a section in Golland's book entitled the "Development History of the Gold Star" discussing the measures BSA took to adequately lubricate the big end, and especially where the cage might rub. 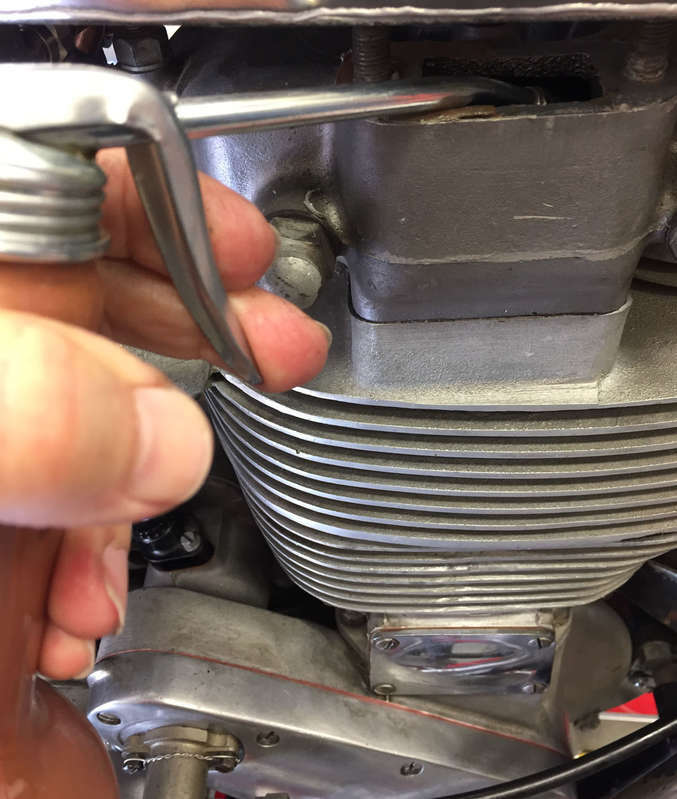 Their later efforts included "clocking" the oil feed holes in the pin relative to the crank position, and also adding feed holes in the pin to alleviate friction between the cage and the pin shoulders. I too, hope my earlier suggestions prove correct, but Kerry may well have nailed it. In any case, checking the simpler causes will be easy, and would be done "on the way in" to checking for a more serious defect in the big end. how about the bush in the timing side support plate? Of those two possibilities the answer turns out to be possibility #3 -- seized breather. Hallelujah, this looks like a 30 min. job at the cost of a gasket rather than several days and major dollars. 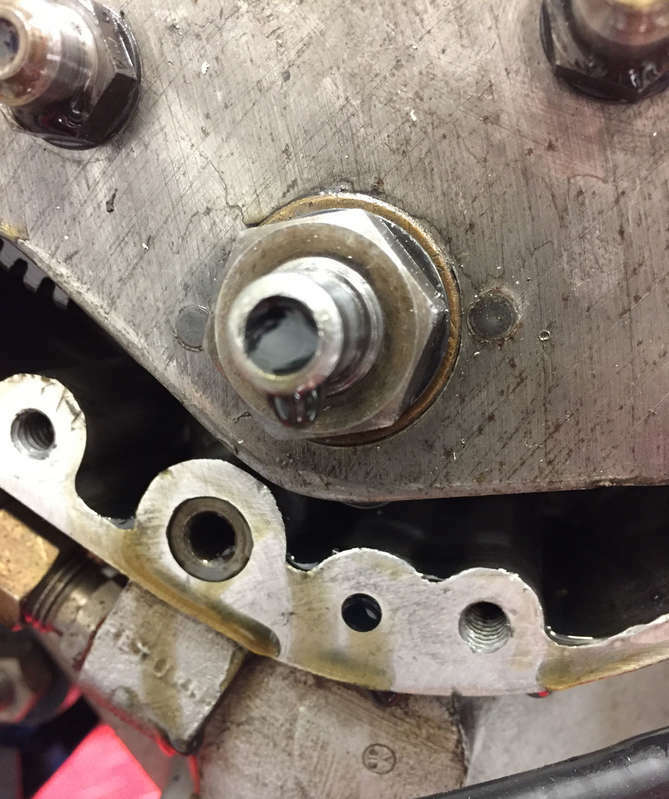 As the first photograph shows, when I pulled the timing cover off oil dripped from the crankshaft feed, so that was a good sign that oil had been flowing. Next I could rock each of the cam gears back and forth against the backlash, indicating they were free in their bushes. At that point I noticed flecks of Al near the magneto gear, as shown in the second photograph. I couldn't get the breather out of the timing case that I had left hanging from the cable, so I removed the tach drive and had to drift the breather out of the case using a socket. The third photograph shows the scoring of the cover caused by the seized breather. And, yes, with the timing cover off the engine turns over without problem. I've never been so happy to find a seized part. If only I had a Sunnen hone... oh, wait, I do. Excellent, if surprising result! Happy to be wrong! Jetting will be done by Sunday then! No one is happier than me. When I found the breather wouldn't rotate and then tried the kickstart lever, the clouds parted, the fog lifted, and a flock of songbirds appeared chirping with joy. Now we have to answer the question: "Why did the breather seize in a timing chest which should have returning oil splashing around in it?" 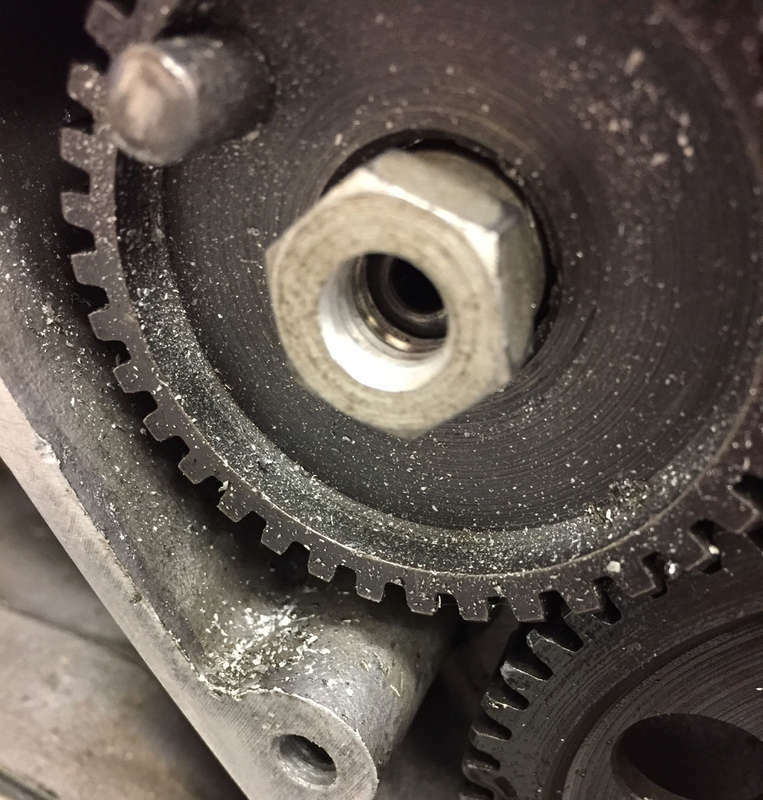 Is not enough oil coming into the chest, or is it being drained away too quickly, so that there is not enough oil for the timing gears to pick it up and distribute it upward? I wonder if this failure has a cause similar to what results in the crank's oil feed stub seizing in the support plate bush? I'm reminded what my friend, whose shop burned down two weeks ago, says when asked what is the "best" oil to use -- "Any oil is way better than no oil." The seized breather illustrates this fact. I hadn't run that bike in a long time so the cause could be simple, such as just taking longer than the ~30 sec. it ran to fill the cavities and wet the surfaces before oil could make it back to the timing chest. Or it could be more complex, such as having developed an air leak in the lines, or the oil pump has gone bad with time. When I assembled it yesterday I used cam lube on the breather to keep it happy until oil takes over the job, but I will investigate the other possibilities today before I start the bike. And, once I do start it, I'll have the oil cap off so I can confirm that oil is returning to the tank before I peg the rev limiter. MM: Your adventure points to the whole area of splash/mist lubrication which I think is a major cause for engine start up wear. Most of us keenly pre-lube these areas when we build an engine but that is where it normally ends. 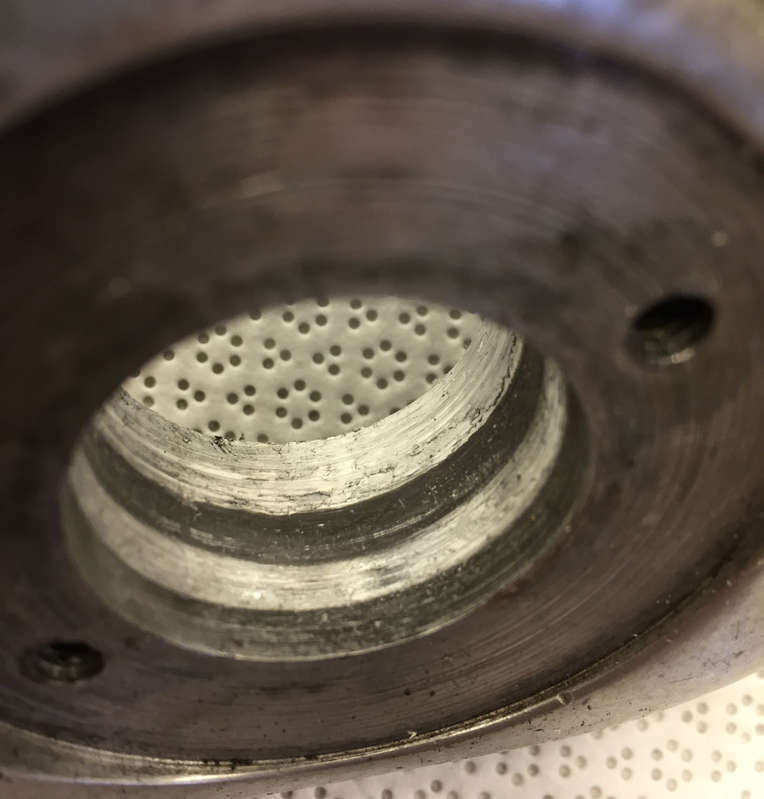 One only needs to think of the pressure put onto a dry cam lobe and cam follower when cranking over an engine that has not run for a long time. Until the engine starts and oil starts to flow it will be metal to metal after a few kicks. Imagine the dry engine that took dozens or even hundreds of kicks to get going. Kicking will quickly pump oil into the crank but that will be about it. 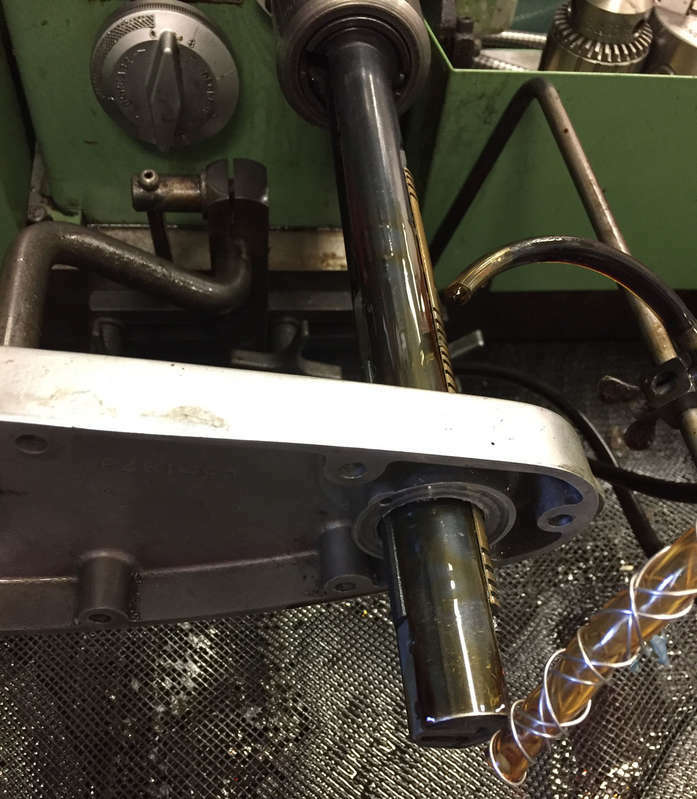 The GS will at least be pumping oil into the cam spindles but it will not immediately get to the lobes or other area needing splash or mist lubrication. I always attempt to lubricate as much as possible before I start up a sleeping engine. It varies from engine to engine but most have some easy way to get some oil trickling down towards the cams before starting. 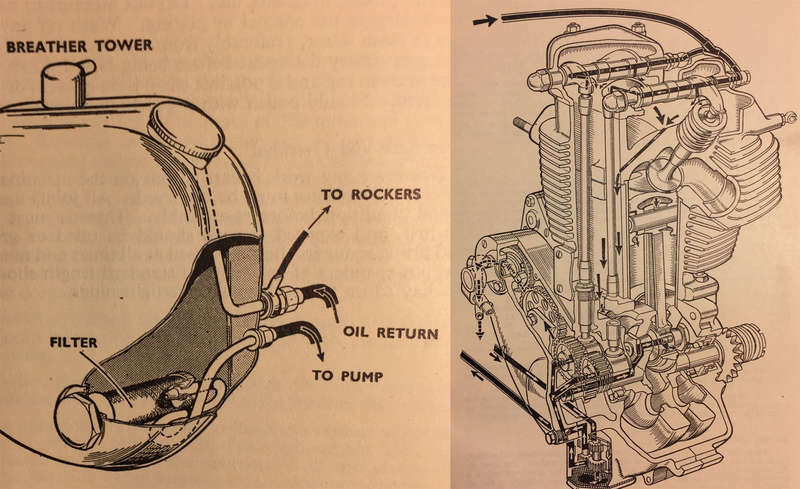 The A65 has the rocker cover for access, the Triumphs have the four rocker inspection caps, the unit singles have the two rocker inspection caps and the pre-unit BSA singles have either the tappet recess cover or rocker inspection cover. The later timed breather GS engines have either a cover or a tach drive that can be removed to access that area for a little pre-start lube. Most of the rockers covers I have seen have real wear in the area of the timed breather. 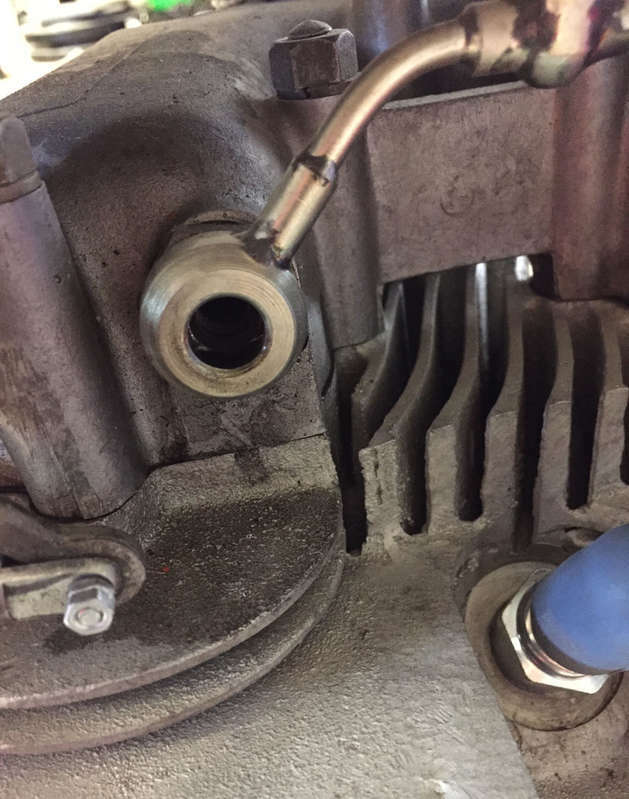 As the first photograph shows, the oil from the tank has to flow 750 miles (estimated) before it finally gets to the small pipe that leads to the rocker cover, then drip down to the timing chest, where it finally can lubricate the breather. It took me all of 15 minutes this morning to pump roughly a pint of oil everywhere in the rocker box that the stream from the oil can could reach, along with straight down the pushrod tunnel to the timing chest. This included removing the two bolts from the rocker feed and pumping oil directly into both rockers. The 15 min. I "saved" by not doing what I "knew" I should have done resulted in unnecessary engine wear as well as much more than 15 min. of frustration spent trying to start an engine with a breather that seized because I hadn't taken the time to add the oil. With that out of the way, I put fuel in the tank, the magneto on half-retard, tickled the carburetor, and it started immediately on the DocZ. Oil from the return line was flowing so I took a couple of laps of the driveway. Given that it wasn't fully warmed up and the driveway limited in what I could do, it feels like the slide cutaway could be correct. Also, when I tried to set the idle (again, not fully warmed up), I had to have the pilot screw almost all the way in so I'll switch from the #30 jet to a #25 when I get a chance. The extra pint or so of oil I squirted into the engine today caused the oil tank to become too full (accentuated in the photograph by the bike being on its side stand) so I sucked 350 cc out. This makes the level lower than I originally had it but makes it easier to see oil squirting back from the return line. After I gain confidence in the oil pump I might add a bit of oil to the tank, but I might not. Sadly, that's all the testing for today. My granddaughters got a new pony and they want to show it to us when they get out of school. 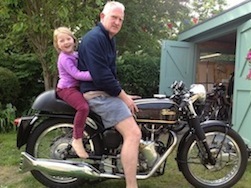 I'm sorry to admit it to the true bike junkies, but jetting a Gold Star falls lower on the priority list than making my granddaughters happy. The 15 min. I "saved" by not doing what I "knew" <SNIP>. "There's never enough time to do it right, but there's always time to do it over ..."
Sounds like you now have it under control. 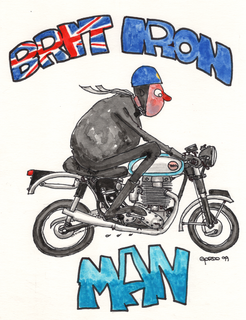 Congratulations MM, for wrestling the old beast to the ground! I did a short loop in the neighborhood this morning and the jetting seemed great (at least up to ~40 mph) so I decided to attach the air/fuel sensor and data logger. I proceeded slowly, trying to make sure nothing could fall off, or get caught in the spokes, so that took about 90 min. The photograph shows the final result. Everything is held in place by nylon straps or zip ties, but I also used blue tape to keep a few things from wiggling. Starting from the back of the bike there's a sealed 12 V battery. Next is the inductive clamp around the spark plug lead for determining rpm. Located at the bend in the pipe is the wideband sensor. Clamped to the handlebars is the throttle position sensor based on a potentiometer and AA battery. And on top of the headlamp, along with all the extra wire, is the Innovate LM-1 and an accessory called the LMA-2 that accepts the input from the inductive clamp along with five 0-5 Volt channels. I'm only using one of the channels, for the throttle position sensor. I started the bike, fired up the Innovate LM-1 (which takes ~30 sec. to warm the sensor), hit 'R'(ecord), and headed out on a planned ~10-mile loop. Unfortunately, I hadn't emptied the memory since I last used it and failed to see the brief message telling me it was full. Actually, I did see a message come up on the screen but didn't pay attention to it so I can't blame the unit. The bike ran fairly well as I exited the neighborhood but the A/F readings were pretty low, i.e. rich. I didn't pay a lot of attention to the numbers (but they were often in the 11s and 12s, and almost never hit 14) since it all was, ahem, being recorded for later viewing. When I returned to the neighborhood I was behind a car going slowly and the bike started loading up. 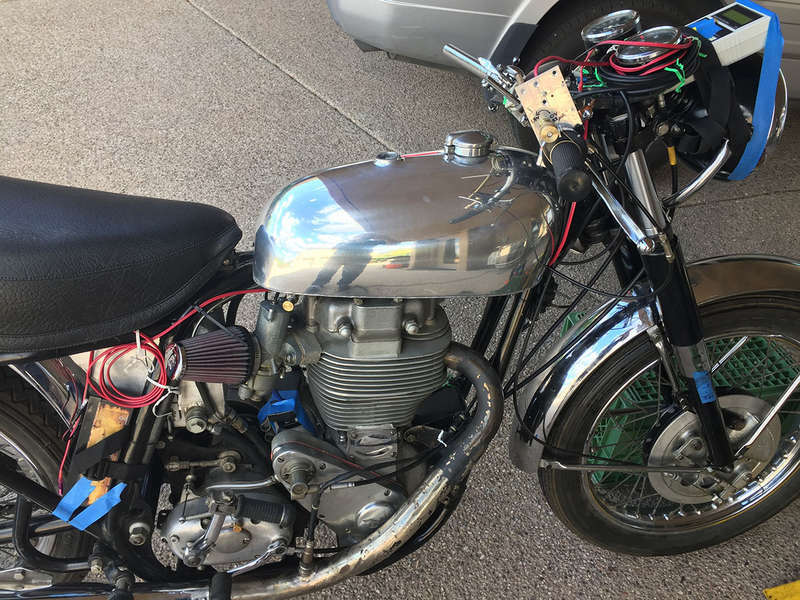 I was afraid it would die on me so I reved the engine to get it running well and passed the guy on a blind curve going maybe 20 mph at 4000 rpm. I'm sure he rightfully was swearing at me for being such a [***]. I made it back home and up the steep driveway only to discover when I was back under the carport that there was no flashing 'R' in the display to indicate it was recording. So, the DocZ started the bike again but I didn't get any further than the gate before it was 8-stroking at anything other than idle. That ended the day. Since the richness is most pronounced at low throttle settings I'll change to a 25 pilot in the morning and hope that makes a big difference. Dropping the needle isn't an option since it's already on the top notch. Now that I've cleared the LM-1's memory tomorrow's run should be more enlightening than today's. A mini heat wave already had us at 96 oF at 1pm and it's now 3:30 pm and 98 oF so I only was able to make one ride today. OK, I could make more, but did I mention it's 98 oF? 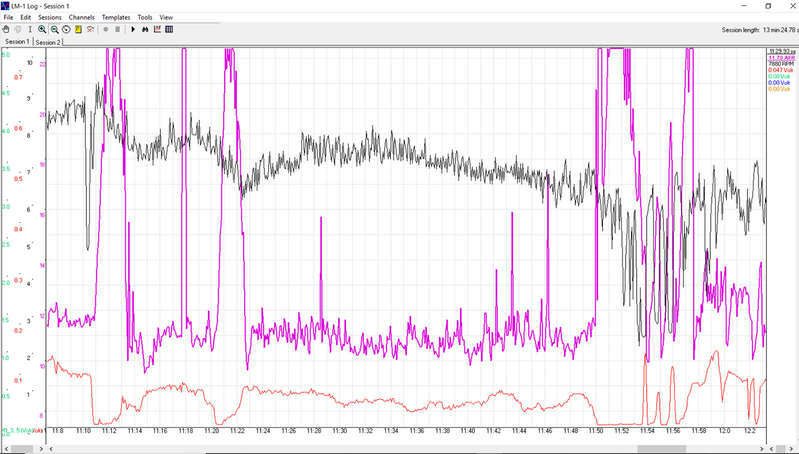 A few notes in reading the attached two graphs from my data logger. 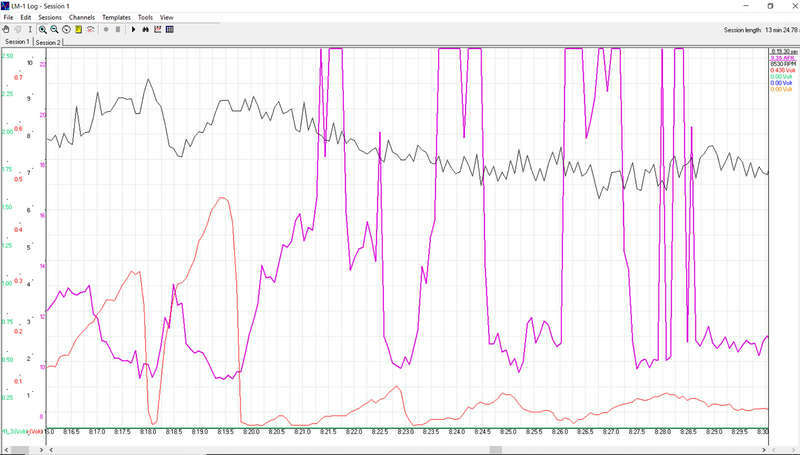 The values for AFR (magenta), rpm (black), and voltage from the throttle position sensor (red) at the upper right are from the time into today's run (11 min. 29.33 sec. for the first graph) where I had the cursor set when I took the screen shot. The rpm values shown in black are 2x what they should be, apparently because the inductive clamp I have laying directly on the magneto is picking up a signal from there as well as the wire. The voltage values are 1.5/5.0 of what they should be because I incorrectly tricked the program when it imported the data -- I should have used a factor of 5.0/1.5. The appropriate scales for these three quantities are shown in the same colors on the Y axis. As background, the stoichiometric ration for old fashioned gasoline is 14.7, and maximum power from most engines obtained around 12-13. Referring to the first graph, during the interval between 11:22 and 11:48 it can be seen that I had the throttle at a fairly constant ~0.1 so it was mostly running on the pilot circuit. The AFR can be seen to have been a very rich 11 or so. The four sharp spikes in this time interval are because the engine missed, allowing raw fuel and oxygen to pass through to the exhaust. Engine rpm was ~7800/2 = 3900 so each combustion cycle was (3900/2)-1 = 0.5 msec. The fact these spikes are seen tells us the response time of the sensor is at least this fast. The three regions near 11:12, 11:20 and 11:52 show that when I completely rolled off the throttle the exhaust mixture got very lean because only air and a little unburned fuel was passing through under that circumstance. Turning to the second graph, I had the cursor placed at 8 min. 19.3 sec. for the screen shot, at which point the throttle was wide open. Note that the AFR is a very rich 9.35. Starting at the far left of this graph it can be seen that over a time of ~1¾ sec. I increased it to ~½ throttle. Up to ~¼ throttle the AFR stayed around 13, but then started dropping as the throttle opened wider, dropping to ~10. I briefly let off the throttle, then rolled it back on to full throttle. Again up to partial throttle the AFR went back to ~13, but again it dropped to below 10 by full throttle. 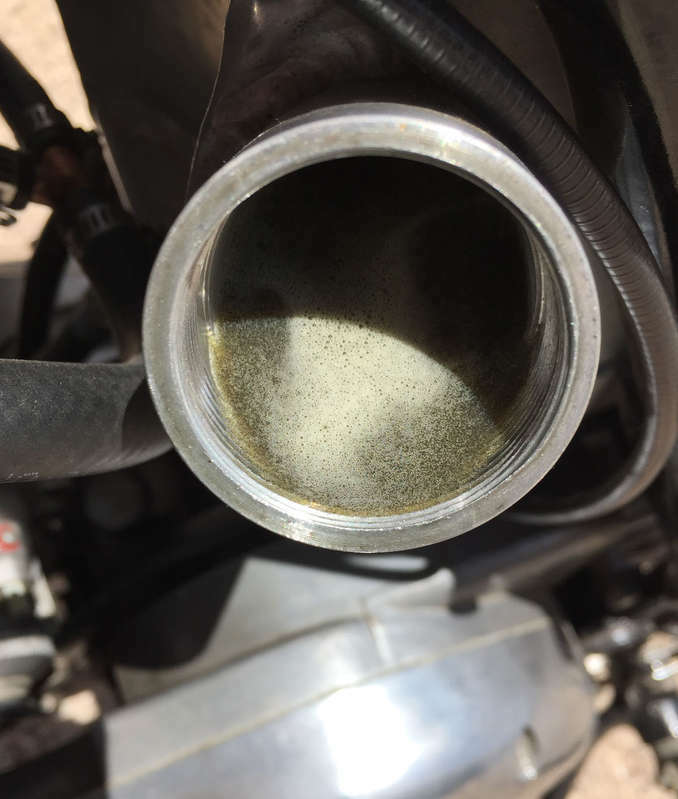 Note that these are "transient" behaviors, not steady state, so there's a lag between changing the throttle position and the engine catching up with the change. It's not worthwhile analyzing this data any further. The bike was very rich and, as a result, it would load up at low throttle settings and I'd have to rev the engine to clean it out enough that it would again run smoothly. So, there's a lot of bad behavior reflected in various time intervals. This morning I replaced the #30 pilot with a #25 but did not adjust it before today's run for reasons not worth going into. Had it been adjusted I assume the AFR at low throttle settings would have been more reasonable than the super-rich <10 that caused the bike to load up today. I'll drop the main jet by a couple of sizes and adjust the idle mixture before setting off on a similar run tomorrow.